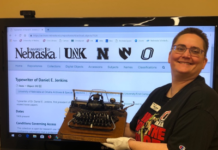 The University of Nebraska Omaha’s student writing organization, The Crop, is hosting a series of events this semester known as the Faculty Reading Series. The series features professors from UNO who read and perform their own works throughout the spring semester. The events are Wednesdays at 7:30 p.m. in the Milo Bail Student Center Dodge Room. The first event, which was held Feb. 1, was a double header with Art Homer and Richard Duggin. Duggin is the founder of the UNO Writer’s Workshop and has taught at UNO for the past 40 years. The second event will be held Feb. 22 and is a fiction double header with Margie Lukas and Lisa Sandlin. The third event is March 7 and is a non-fiction double header with Jody Keisner and Tammie Kennedy. The fourth and final event, a poetry double header with Cat Dixon and Todd Robinson, will be April 11. “I think it’s sensible that students want to hear the work of their teachers,” Sandlin said. “I checked mine out when I went to grad school, to hear their voices, to see whom I thought might respond to my own sensibility.” Sandlin hasn’t decided what she will be reading on Feb. 22 yet. Along with the reading series, The Crop also hosts writing workshops where students can receive and share feedback about their writing. The workshops are on the first and third Monday of each month and held in the Weber Fine Arts Building, room 318, at 6 p.m. Creative non-fiction, fiction, poetry and other genre works are welcome. According to The Crop’s website, interested students should bring a few copies of anything new, improved or in progress. Students can also submit their work in advance by emailing copies to any Crop officer and copies will be made for them. A list of officers can be found on The Crop’s official Facebook page. Students can also leave a physical draft, with a note indicating the date of the workshop, in The Crop mailbox (WFAB 310) one week in advance. 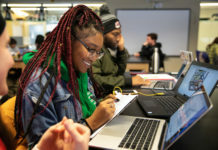 Students can also participate in electronic workshops through the discussion board feature of The Crop Blackboard site. To participate, students should contact the president of The Crop, Dianne Hradsky, at dhradsky@unomaha.edu.